Release Date: October 27th, 2006 by Lionsgate Films. The Cast: Tobin Bell, Shawnee Smith, Angus Macfadyen, Bahar Soomekh, Dina Meyer, J. Larose. BASIC PREMISE: Amanda (Smith), kidnaps Lynn (Soomekh), a doctor, and forces her to keep Jigsaw (Bell) alive while more victims get tortured in elaborate death traps. ENTERTAINMENT VALUE: Saw III doesn’t really add anything new to the franchise except more blood ‘n guts and imaginative, complicated death traps. Jigsaw, who has already been established as terminally ill in Saw II, lays hooked up to a monitor in a room that resembles a hospital room. He now has a female assistant who wants him to stay alive, so she kidnaps a doctor and puts a device around her neck that would kill her if he dies. A few twists help to explain the assistant’s relationship to him, but what’s most suspenseful is waiting for the next inventive death trap. Of course, Jigsaw has specific reasons for selecting his helpless victims, none of which you really care about. Also, there are a few plot holes, such as how Jigsaw could design the traps with such poor physical health—but that’s beside the point. 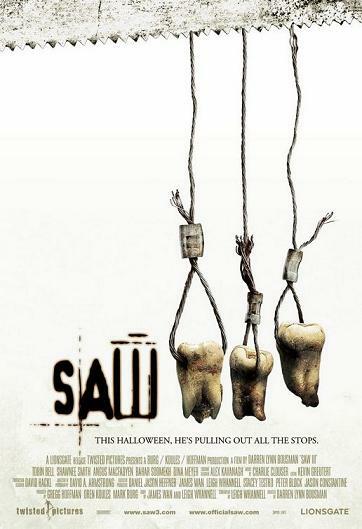 What’s important is that Saw III feels truly scary and, indeed, it does deliver that thanks to director Darren Lynn Bousman who adds an eerie musical score, chilling set design and plenty of squeamish, cringe-worthy scenes which live up to the R-rating. None of these scenes will be spoiled here, but—be warned—you will certainly have nightmares if you’re not a seasoned horror buff. IN A NUTSHELL: Relentlessly gory, perverse and terrifying, just as expected.